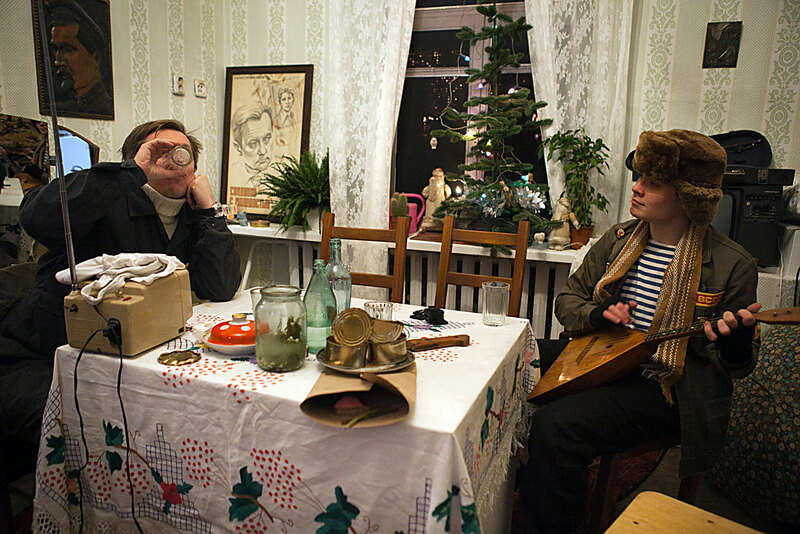 Two men drinking vodka as if they are sitting in the Soviet era kitchen room seen at the Museum of history of alcohol dependence, a part of the Museum of all the museums project, opened at the All-Russian Exhibition Centre (VDNKh) in Moscow, Russia. If you find yourself in Russia, you will have to drink with Russians, one way or another. Follow this handy guide for advice on how to manage the experience without waking up the next morning wondering “Where’s my wallet?” “Who is this person next to me?” or at the very least with a terrible headache. Contrary to popular belief, Russians are not alcoholics, and they do not drink just for the sake of doing so. However, Russians are happy to raise a glass to practically any occasion — a new job, a new car, Friday…but especially for a wedding. As a rule, you have time to prepare for a bender, but sometimes trouble sneaks up on you. Say you get home from work on a Tuesday night having met a friend you had not seen for a long time in the subway. Isn't this a significant event? Always be on the alert. There will likely be times when you will have to drink on a weekday evening or in the middle of the night. And definitely on Friday. And most likely on Wednesday: because everybody in Russia knows that Wednesday is a little Friday. Russians drink other things besides vodka. But of course they do drink vodka. You should be aware that a Russian party is structured differently from parties in other parts of the world. First, the alcohol is usually bought by the host. This solves two problems at once: at first the guests do not have to know that they will have to drink and then they do not have to regret that they were unable to switch to something else after wine ran out because they did not bring it. The table full of drinks is for all, so drink whatever you want. Just do not overdo it. Brush up on your knowledge of all key events in world history, religion, politics, sports and arts, and make sure to form an opinion on all current issues, whether or not they seem important to you. First off, when drinking, Russians are sure to start a conversation about lofty matters. If you do not take part in these discussions, you will run the risk of simply falling asleep at the table – or drinking more to avoid having to talk. Secondly, such knowledge is simply useful. Do not be afraid of expressing your opinion. All conversations and disagreements that take place while drinking will not be held against you — no one will remember them in the morning. Around 11 p.m., there is unprecedented level of activity in Moscow supermarkets and convenience stores. In Russia, there is a law that says alcoholic beverages cannot be sold later than a certain time, although the time varies. In Moscow, it is 11 p.m., while in St. Petersburg, it is 10 p.m.
Russians like to make lengthy toasts. Of course, the toast depends on the circumstances, but the more solemn and important the event, the longer the toast. It is customary to take a glass in your hand at the beginning of the speech and not lower it until the speaker has finished. You should train yourself to keep your hand raised for a long time. After the toast, you must clink your glass against the glasses of all those present at the table. If you are a single girl, keep in mind that an old Russian superstition holds that the last person you clink glasses with should be an unmarried man – then you will marry soon. In the West, it is perfectly fine to take a drink and put a half-full glass back on the table before you take another drink. In Russia, however, you have to drink everything in the glass at once, otherwise people will think that you disagree with a person who delivered the toast — for which he likely rehearsed for a week before the event. The toast "Na zdorovye!" or “to your health,” which foreigners for some reason consider to be the most popular and appropriate toast to make in Russia, is not used by anyone. Ever. To really prepare for drinking with Russians, watch the classic Soviet film “The Irony of Fate, or Enjoy Your Bath." This movie is always shown on New Year’s Eve, and everyone knows it. Even if you watch it before your visit, you are likely to have to watch it again. But besides being a classic Soviet movie everyone should know and the source of 95 percent of the references made by your Russian friends, it shows clearly how not to drink — and what can happen to you if your visit to a banya with your friends goes wrong. To drink with Russians is an art and, like any other, you will not be able to master it at once. But you will never be bored drinking with Russians, and if you can endure the first few times, you may even grow to like this process. Probably you will. And, upon returning home, you will look differently at the wildest parties thrown by your friends, thinking to yourself "That's nothing; in Russia, they call it 'propustit po stakanchiku' (to grab a drink)."